Collards are a member of the Brassicaceae family. They are grown for their leaves, which are cooked, much like kale. This cooking green is most often associated with Southern U.S. cooking and the plants do indeed favor warmer climates. They are native to the eastern Mediterranean and Asia Minor, but the plants are easily grown in most climates. As with kale, collards are non-head forming cabbages. In fact, collards and kale have often been considered the same vegetable. Genetically they are not much different, but breeding and cultivating over the years has produced plants with different textures and flavor. Collard leaves have a broad, oval shape, very distinct veins and a smooth, almost waxy texture that needs more cooking than kale and collards tend to have a stronger and sometimes more bitter flavor. Cooking greens are some of the most nutritious vegetables you can eat and collard greens, in particular, are packed with vitamins A, C and K, soluble fiber, calcium, folate, manganese and tryptophan - and less than 50 calories per serving. Eating your collards even helps to lower your bad cholesterol. Leaves: Collard leaves are smooth and almost waxy, with pronounced veining. They can be quite large and bright to dark green. The stems are very fibrous and tough. Flowers: True to the cruciferous family, collard flowers have four yellow petals in the form of a cross. They are edible and have a sweet, cabbage-like flavor. Collards can over-winter from about USDA Hardiness Zones 6 on up, but they are only biennial. Most varieties are ready to harvest in 55 - 75 days. You can harvest leaves as needed or cut the entire plant. If you cut the entire plant while it is still young, the crown should resprout for at least 1 additional harvest. Collards are often grouped by 2 growing characteristics, those that are loose-leaf and those that form a loose-head. Traditional varieties, like 'Vates' and 'Georgia', form loose, open plants. Some of the newer hybrids, like 'Morris Heading', grow quickly and curve in on themselves, forming a loose head and a more compact plant. Loose heading varieties are good choices if you want to harvest the whole plant at once. If you want a steady supply of leaves, I would opt for a loose-leaf variety. Collard greens are very versatile. You can try the traditional method of boiling them, but I like to leave them with some substance and either lightly steam, sauté or braise mine. Harvest leaves while they are smooth and firm. Young, tender leaves will be the least bitter. You can store them in damp paper towels for about 3 - 4 days, but the longer they are stored, the more bitter they become. Better to harvest as needed. There's good reasoning behind the phrase "mess o' greens." One pound of uncooked leaves yields about a 1/2 cup of cooked greens. Soil: Collards will have fewer problems with clubroot if you plant them in a slightly acidic soil pH of about soil pH of 6.0 to 6.5. Since you're growing collards for the leaves, you'll want a rich soil, with lots of organic matter. Planting: You can start collard plants from seed or transplant. They can handle cool spring weather. Start seeds outdoors, about 2 weeks before your last spring frost date or get a head start by sowing seed indoors, 4-6 weeks earlier and planting the seedlings right around your last frost date. For a fall harvest in cool climates, plant in mid-summer, about 6 to 8 weeks before the first fall frost date. 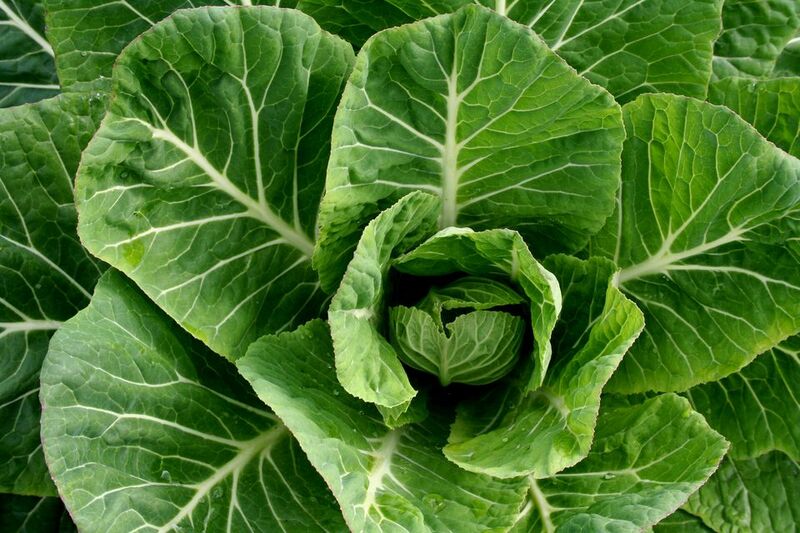 With protection, you can harvest collard greens well into winter. In USDA hardiness zones 8 and higher, you will get your tastiest crop by planting in the fall and harvesting throughout the winter. Cool weather sweetens most cooking greens and collard greens are no exceptions. Sow seed 1/4 to 1/2 in. deep. Collards are large, open plants. You can space them 18 - 24 in. apart or plant them more thickly and thin and eat young plants, until you reach the desired spacing. Keep the plants well watered and harvest regularly, to keep them sending out new leaves. Side dress with composted manure or a slow release fertilizer every 4 - 6 weeks to keep the plants growing, through repeated harvests. Collard greens can take a light frost, but you will lose your plants if the temperatures stay below freezing for long periods. To continue harvesting in cold areas, protect your collard greens with some type of hoop house or cold frame. Collards are biennial, so plants will need to be overwintered if you plan to save seed. Collards are affected by the same diseases and pests as other members of the cabbage family, although their tough leaves offer some protection. Insect Pests Be on the lookout for aphids, cabbage loopers, cabbage worms, cabbage root maggots, flea beetles and even slugs. Diseases to watch for include; blackleg, black rot, clubroot and cabbage yellows. Diseases tend to build up in the soil, so do not plant collards in the same spot every year. Rotate all your cruciferous vegetables and if you have a disease or pest problems, don't leave them standing through the winter.